To display social sharing buttons before and after your post’s content, activate the Inline Content share tool from Social Pug -> Toolkit, by clicking the switch button shown in the screenshot below. Once active, click the “Settings” link that has appeared at the left side of the activation switch button. 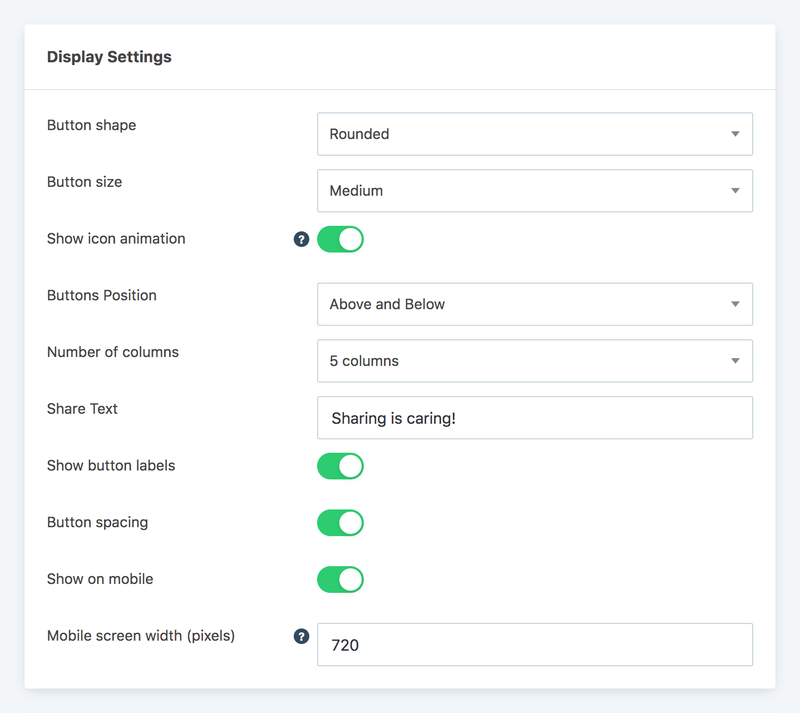 This will redirect you to the Inline Content settings page where you will be able to customize the look and feel of the social sharing buttons. Once you are redirected to the Inline Content’s settings page, the first thing you should do is select what buttons/networks will be displayed to your visitors. To do this, click the “Select Networks” button from the “Social Networks” section. Once the button is clicked, a panel with all available networks will open. 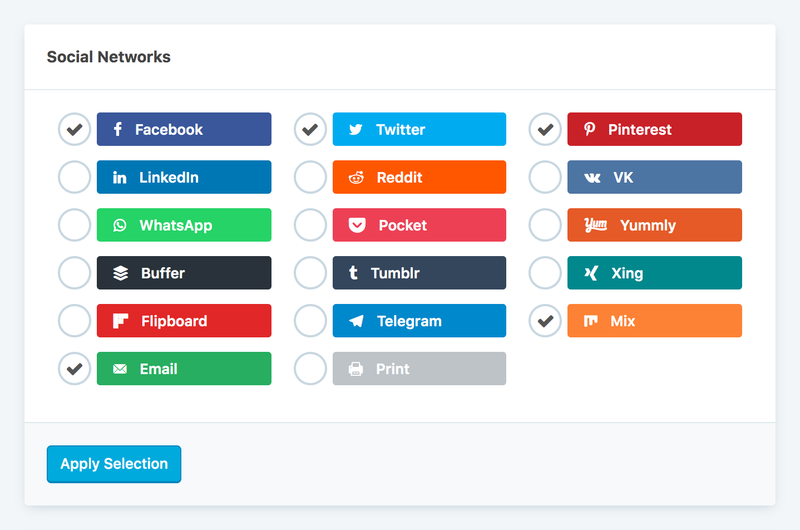 Check the social networks that you need, and then click the “Apply Selection” button, from the bottom of the panel, to complete the selection process. After you have selected the networks, you can sort them in whichever order you wish them to appear for your visitors. To sort the items, click and hold the sort icon (the one represented by the three horizontal lines) on the left of each item and move the item in the desired position. You can edit the label for each one of the selected buttons, by clicking the “Edit Label” link of the item you wish to make the change for. This feature is especially useful if you wish to have a better call to action than the default one. Instead of the default “Twitter”, you may wish to have “Tweet me!”. 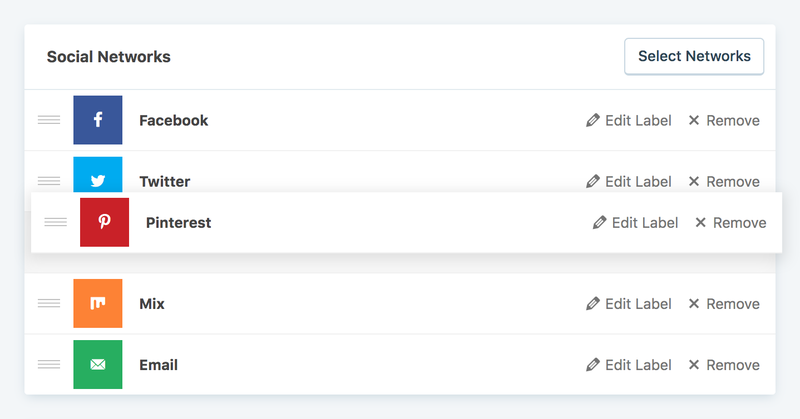 The “Inline Content” share tool has eight styles from which you can choose. To select one, hover over the one you like and click it. The styles represented here are just a guideline for how the buttons will be displayed to your visitors. The buttons’ final esthetic depends on the options selected in the next sections. Button shape: Modifies the shape of the button to the selected one. You can select between three shapes: rectangular (buttons with right angle corners), rounded (buttons with slightly rounded corners) or circle (buttons with fully rounded edges and no corners). Button size: Modifies the size of the buttons. You can select between three sizes: small, medium or large. Any other button size changes can only be made with custom CSS code. Buttons position: You can opt to display the sharing buttons just above the content, below the content or both positions. Number of columns: This determines the width of the buttons. If you select “Auto Width” the buttons will come one after another and have the minimum width they need to display correctly. If any other option is selected, the buttons will be arranged in a grid. Show labels: Whether to show or not the editable labels of the buttons. Button spacing: Adds bottom and right spacing for each button. Show on mobile: Whether the buttons should appear on small screens or no. From the “Buttons Share Counts” section you can configure the social share counts options for this sharing tool. both above options at the same time. Show share count: Display the share counts for a post on each individual button. Show total share count: Display the sum of the share counts for a post for all active social networks. Total count position: Whether to display the total share count before the buttons or after the buttons. This option is active only if the “Show total share count” option is enabled. Share count round: If you have high social share counts, passing a thousand, the number will be rounded. For example, if the post has a total count of 1457 shares, with this option active, the value displayed will be 1.46k, instead of 1457. 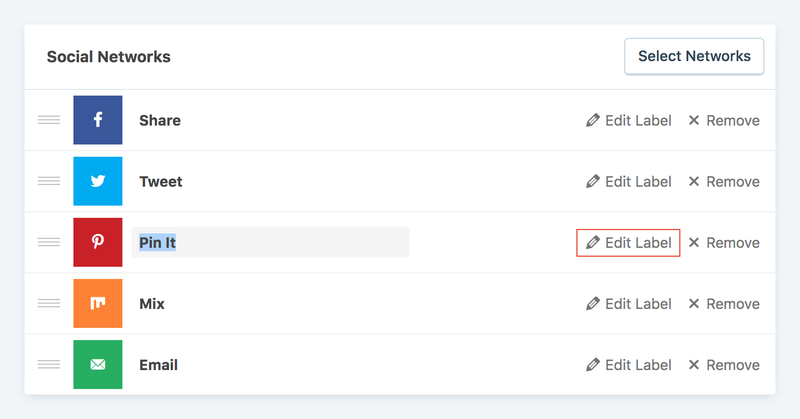 This options is active only if the “Show share count” or the “Show total share count” is enabled. 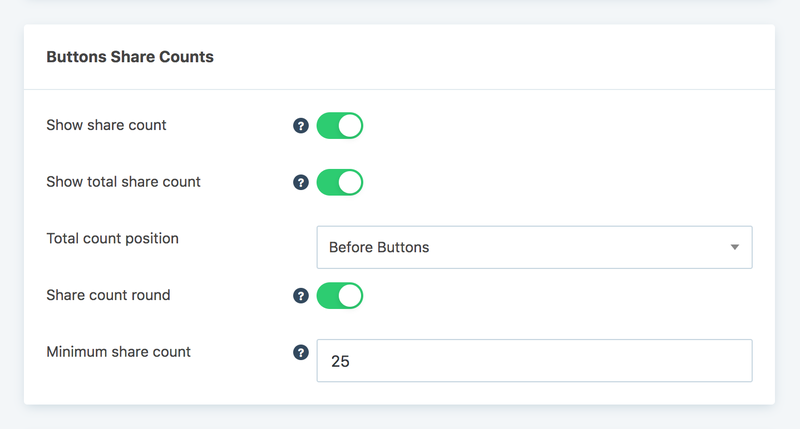 You can customize the colors of the buttons to match your website’s design, by selecting the color for the normal state and also for the hover state of the social sharing buttons. Buttons color: Applies the selected color to all buttons of this share tool. If the “Buttons hover color” is not set, when hovering over the buttons the default color of the social network will show. Buttons hover color: Applies the selected color when the user hovers the mouse over the button. You can display the social sharing buttons from this share tool on single posts, pages and custom post types that are registered as public. To show the buttons only on Posts, check the “Post” option, as shown in the above screenshot.